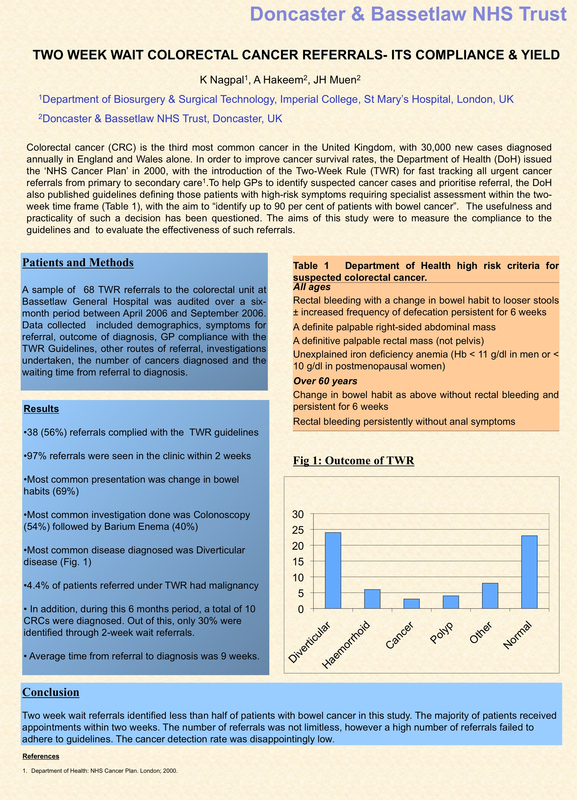 Two Week Wait Colorectal Cancer Referrals – Its Compliance and Yield? Introduction: The two-week rule in United Kingdom was introduced to ensure that all patients with a suspected colorectal cancer (CRC) saw a hospital specialist within 14 days of an urgent GP referral. The usefulness and practicality of such a decision has been questioned. The aims of this study were to measure the compliance to the guidelines and evaluate the effectiveness of such referrals. Methods: All patients who were referred under two week wait target for suspected CRC over six months period were included. Results: A total of 68 referrals were made. Change in bowel habits was the commonest (69%) cause for referral. Most common investigation used was Colonoscopy (54%) followed by Barium Enema (40%). Diverticular disease was the most frequent (35%)condition diagnosed. Forty four percent of referrals did not comply with guidelines. 97% of patients were seen in the clinic within 2 weeks. Three colorectal cancers (4.4%) were diagnosed out of which two were rectal and one was caecal. In addition, during this 6 months period, total of 10 CRCs were diagnosed. Out of this, only 30% were identified through 2-week wait referrals. Average time from referral to diagnosis was 9 weeks. Conclusion: Two week wait referrals identified less than half of patients with bowel cancer in this study. The majority of patients received appointments within two weeks. The number of referrals was not limitless, however a high number of referrals failed to adhere to guidelines. The cancer detection rate was disappointingly low.